Each spoon has a detailed design on both the front and back. These spoons provide a unique combination of style and function. Made from a sturdy zinc alloy. 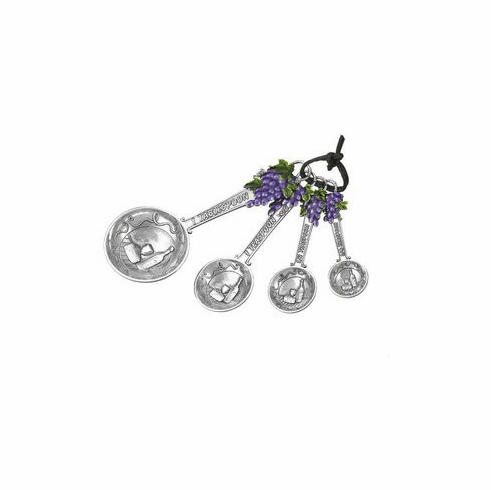 Each spoon has grapes at the top of the handle and the spoons are decorated with a wine bottle and wine glasses. This spoon set includes: 1/4 teaspoon (3 inch), 1/2 teaspoon (3.25 inch), 1 teaspoon (4 inch), 1 tablespoon (5.25 inch). Dishwasher top rack; Hand wash recommended.